We decided that our little farm needed a root cellar to store our produce in. For those unfamiliar with the term, a root cellar is an underground room that acts like a natural refrigerator, maintaining temperatures in the mid 30's F in the winter and mid 50's in the summer. Almost finished here. Now, for the fun part, pouring a concrete roof. A simple flat slab wouldn't do, for you want condensation to run off to the sides. So, I created a plywood from with an arched top. The arch would also create a stronger roof. It also created a very strong form. The arches are 1/2 inch plywood pressed into dadoed grooves in the 2x4's. This created an extremely strong structure. A nice snug fit, supported by 3 vertical 2x4's on each side. (Not shown in the picture are 8 pieces of 1/2" plywood approximately 6" x 23". These were installed after the plywood sheets were added. They are used as extra reinforcing ribs by wedging them between the plywood sheets and the top of the 2x4's.) Next, the plywood, a sheet of plastic and lots of 1/2 rebar. Lots of rebar. Rebar is cheap, so why not? If this were a flat 4 inch slab, the calculated load rating is around 250 pounds/square foot. More then enough. But it is arched, and up to 5 inches thick. Also the rebar extends into the walls a foot, and are cemented in place. Not sure what the load rating is now, but it is certainly more than adequate. A solar hot water heater. This has performed far beyond my expectations, even in winter. If you can find a used system, like I did, it will pay for itself in only a few years. Rion Greenhouse. An easy to assemble greenhouse kit that has proven to be durable in high winds and heavy snow. It is now 5 year sold, and has held up well. Insulating and finishing the interior of a pole barn garage/workshop. How I gave my pole barn a nice insulated interior in a budget. Thanks so much for the detailed descriptions! We will be adding you to our "watch" list. Looking forward to reading about your other projects. My hubbie was excited as he wants to build a similar design (root cellar). Great pictures with details. We have an existing cellar, but are planning to build somewhere else in the future. This is a great blueprint for what to do. How is runoff handled from the elements coming into the entry stairwell? There is an exterior door, much like a basement entry door. Having two doors is very helpful in providing additional insulation. What's the chance of having a root cellar in the panhandle of Florida, has anybody had luck in this part of the country, our ground never gets very cold and the humidity is always high? Also we are totally in sand, or at least 6' down. It depends on how close you are to the water table. Southern states have a lot of problems with basements in general and the water level. In the sand I would imagine you would have to lay down a solid base of rock once you dug out a whole. You could then pour concrete on that rock layer. Better make it pretty thick and tamp it so you avoid settling problems with the sand. What is the average temp in your cellar? How do you control water and snow melt in the step area. There is an outer door, much like a basement exterior door. robert is than any way to add a vent pipe to relieve the condensation? Concrete is porous. The condensation could be attributed to there being cold joints in the ceiling. I would bet that you are seeing moisture at each of the joints where you stopped placing concrete, as you said you did the roof in three separate placements. One continuous placement could've eliminated this. Unless you used a Waterstop along each joint. Something to consider for future projects. Wonderful discription. We in Northern California get a fair amount of rain. Any suggestions on how to waterproof the walls, the floor and the door? Very nice! Did you leave the concrete top uncovered or did you put soil over it? It has about 2 feet of earth over it. That helps insulate the roof, and supports vegetation (mostly weeds) that shield the cellar from summer sun. just out of curiousity what was the cost of building this? About $1,000. Concrete blocks were $1 ea at the time, and I used about 320. About $500 for concrete and mortar, and the remainder for rebar, wood, etc. Great information, thank you. That seems like a very easy and fairly inexpensive project to do, so you can maximize those garden surpluses. How about using a Bilko door for the outside entrance. To me that is more secure and likely to keep moisture out. I would also tar the cement blocks from foundation to top. As tight as the design in you should have allowed some air flow using 4" pvc pipes out the sides on both ends with curved down facing and with wire mess to prevent rodents from entering. We have had and used cellars for as far back as I can remember. Ours have been made of everything from adobe to river run rock, concrete, cinderblocks and sandstone. We never vented to the sides, always through the roof. I used 6 inch pvc on each end of the last one I did and used a standard roof cap to keep the birds insects etc out I screened with a fine aluminum mesh. Also ran in electricity for light and just in case an outlet for a refrigerator or freezer. Also made bins for carrots, potatoes, squash, melons. They keep really good if covered with sand or straw. This is great, I would love to build one. But, how is it kept from flooding in heavy rains? I have a levee due to digging a pond. The extra dirt is on the east and south side. I have thought about digging into this to make a root cellar or a storage cellar. QUESTION! Which side of your land should you build such a cellar? Is there a drain in the floor to take care of unexpected water build up? I live in Maine, and try to prepare for the unexpected, and water would be my biggest worry. Really appreciate you taking the time to share your project with others, it is practical, functional, and shows your frugal side, thank you. could you this as a tornato shelter? I plan on having a contractor build me a root cellar but not to store vegetables, and only half that size to be used as a 'tornado shelter'. I wanted a root cellar, but when we were first constructing our home, we discovered ground water at around 18 inches down. That immediately changed our minds on a basements also. It does dry out in the summer time, but in my husband's shop during the fall through springtime, his automotive pit turns into a "lap" pool with clear clean water if they sump pump is not engaged. We have a seasonal pond in the back corner of our property... which I can only "hear" in the spring when the frogs converge. Say all that, I'm jealous, we could build it but ALL the EXTRA cost to make it water tight would be non-productive financially. great details and plans for your root cellar. I would like to pin this to my "on the ranch" pinterest board. May I? Thanks for sharing this, it was very well thought out and I really enjoyed reading your play-by-play. and you built your self a great tornado shelter all at the same time! very good! Great article with lots of good information. Two questions: How deep is your frost line? How high is your water table? Thanks! This area is considered a 3 foot frost level. However, I rarely see frost below 2 feet. I'm on a hill, so my water table is about 100 feet down. My well is 300 feet deep. I am fortunate to have well drained soil, which is good for my peach trees. It also has kept my septic system maintenance free for over 30 years. if you had a simple gravel and pipe french drain system around perimeter piped to garden nearby, I believe you would have no runoff issues at all. or, to be even more prepped, run your runoff first thru a sand filter and then second or third stage into a holding cistern buried next to root cellar for additional water storage...trying to prep on a budget in OR.. I find your projects very helpful. We will be acquiring some land to homestead and I have been looking for a simple DIY root celler. Look forward to seeing your other projects. Did you consider burying a steel shipping container? How do you think that idea would compare to your project? My wife is pushing very hard to have me construct a root cellar this summer. Great website. Please tell more about your fund raising. do not use a steel container under ground,the sides will crush inward over time,and will rust all over making it very weak . it is unsafe!! use block.do your research and you will see containers are cheap but unsafe under ground. No, I never considered a shipping container. That would be considerably larger than my needs, and while I haven't priced shipping containers, likely much more expensive. Just excavating that big a hole would have cost a lot more. Then you would need to hire a crane or something to lower the container into the hole. For me, that takes it outside of what I consider a DYI project. By contrast, I did everything but dig the hole. I used my own truck to pick up the materials I used, rather than have them delivered. The funds request is to help cover the cost of hiring full time aids to look after my 92 year old mother. That costs $4,000 or more a month. Shipping containers are not engineered to carry a top load. We see them stacked on ships and in shipyards, but its a direct load on the walls. When buried, the top will collapse and the walls will succumb to the outside pressure from backfill if not significantly reinforced. As they are only 8' wide, interior reinforcement & insulation will take another 8-12" of space...that may not be a problem, but it is something that needs to be considered. Aside from the excavation and placement costs, purchasing a container of any quality can run in the neighborhood of $3,500. There are some amazingly creative things being done with container conversions for studios, mother-in-law / guest units, offices, stogare, vacation property cabins, etc.... so an expanded market for used containers has developed that makes them more difficult to find directly from the first owner - not impossible, but more difficult. Compared to the plans Robert has shared, burying a container could be cost prohibitive. However, compared to the cost of building stick built structure for the purposes i listed, it makes them an interesting alternative. Very and simple project (though actually hard labor). I like it! However, (unless I missed it) you say nothing about sealing the outside walls from moisture, seepage etc..
As long as you are below your frost line, and whatever is above the frost line is well insulated, you should be OK. In my case, I rarely have frost go below two feet. In your case, Montana frost maps place your frost line at 3 -4 feet. My guess is that if you built one like mine, but went one foot deeper than I did, you should be OK. Even with my mild winters, my ceiling gets a little cold, so I'm planning to add 1 inch foam insulating board to it. thank you... I have been wanting to build an underground root cellar for many years. i like to do everything myself. I will look at your plans with more detail, and let you know when i build my own! mine will be into a side of a hill though... too much ground water here. How do you control mold (that black stuff is bad)? Is there a draft pipe? Yes, there are two 4 inch vent pipes at opposite ends. Good ventilation is essential! A root cellar should have 5' of dirt on top for 95% temperature stabilization. To achieve 99% temperature stabilization you would need 30' of dirt on the roof. 5' of dirt could also protect from nuclear radiation fallout. 5' of dirt would be very heavy. A higher arch, more rebars, and additional concrete thickness are needed to support 5' of dirt. An arched roof is stronger than a flat roof. Rocks for drainage should be under and on the sides of the root cellar. Install a french drain. If fresh foods are to be stored, there should be three separate rooms. One for veggies that like it dryer and warmer at the entrance. The warmer entrance room might double as disaster protection for people. A second room for fruits, and a third for vegetables. Fruits and veggies let off gasses than ripen and spoil each other. Shelves should be 6 inches from the wall to allow air circulation, and preferably have air holes in shelves allowing air circulation. There should be an air vent at the floor level to draw in cooler air and an exit vent on the opposite wall at the ceiling for air circulation in each room. Dirt should be brought in and placed over the cement floor for humidity regulation. The floor should have heavy cement so if the soil becomes waterlogged the root cellar filled with air like a baloon doesn't pop out of the ground in a heavy rain (this does happen). Air vents should be disguised so from the surface hungry people don't know where to find and steal your food. Put a dog house over the vents, or a nonfunctioning air conditioner, or have the air vents appear to come out of your house as a laundry dryer vent or something. Make a hidden door going from the first room into the second room, so that if your root cellar is found and some of your food is stolen, not all of it is stolen. Most importantly repent because you need Yahuwah the Most High's protection. If the cellar is to double as a nuclear fallout shelter allow for 3' large air supply intake/outgo opening and make a hand-powered fan to bring in air. To make a hand-powered fan make a 3'x2' frame. String wires across up and down vertically every couple inches. Place plastic flaps on hinges running side-to-side horizontally that will close as you pull a rope towards you, and open on return when you release the rope. Hinge the framed hand-powered fan to the opening of the window. Attach a rope at the bottom for pulling. Have 90 degree turn from the entrance from the window to eliminate 90% of the radiation. You need 40 cu ft of fresh air per minute per person. The minimal 4 cu ft of air/minute/person recommended by FEMA will kill you with too many people in the room. Design openings with a cover so fallout cannot fall down the air openings. Every 90 degrees the entry way turns will eliminate 90% of radiation. Have a 5' mass of dirt between the entry way and the cellar for the first 90 degree turn. 3' of dirt = 1' concrete = 2" lead for density protection from radiation. Insulation helps protect from mold-causing condensation. Put reflective material coming in from the window to bring in the light but not the radiation for any room to be inhabited for radiation protection. The window could also serve as an escape route should the door be blocked from falling trees. Wow I love your description and plan on printing it out for my son. Thank you so much for your info. I really like your project, I see room for improvement but that is how things are built and improved. cost If you included your labor would far exceed 1000 dollars. I am currently bidding a similar project and the homeowner is expecting close to a thousand . wont and cannot be done for a grand. That is correct. Probably more like $2,000 and up. I did not pay for material delivery, for I used my truck. Having to hire a backhoe and operator could be expensive, too. I did not record my hours, but there were many. Just bending all that rebar into a uniform curve took time. The best improvement you can make, imho, is to increase the radius of the ceiling to encourage condensation to run to the sides. Are you concerned about the walls caving since there is only dirt against them and no gravel fill? Love the project and your plans are very well understood. I would live a root cellar but the engineer I am married to would make it so much more difficult to build. No I am not concerned! For many years, 8 inch block walls were used for basement walls in houses. They would often be much deeper into the ground and longer, which would make them more prone to cave in than my root cellar. No gravel fill was used. In addition, my cellar has a steel reinforced roof with the rebars extending into the walls, which makes the whole thing very strong. It appears to me that the engineer is looking for reasons not to build it. I thought you poured concrete inside the block wall too. So you didn't? I'm not to sure I'd skip that. probably be OK, but, still......I know, you were keeping the cost down. I have concrete around the rebars that extend down into the top row of blocks. Below that the blocks are hollow. I believe any more is overkill, for it was not necessary on houses around here. Our ground freezes in the winter for about five months. Will it keep a consistent temperature or would the vegies inside freeze? You need your root cellar to be substantially below your frost line. I would guess that if it half below and half above, with the upper half insulated, you will be OK. Here the official frost line is 3 feet. I rarely see frost below 2 feet, so I have been OK. I am not sure how root cellars are built in places like Minnesota, where the frost line is 5 feet. Wspaniała ziemianka! Prowadzę bloga o architekturze i pozwoliłam sobie skopiować zdjecia, dopisać kilka słów i oczywiście zlinkować Pana njako autora tego wspaniaego obiektu. muszę pogratulować przemyślenia sprawy i zastosowania ciekawego rozwiązania. W poście znajduje się kilka innych ziemianek - zapraszam do pooglądania i dziękuję za inspirację!! Robert - we've been trying to decide how to build a root cellar - we live on a hill with a house about 2/3rds of the way up. But when we first moved here to KY we did see the block basements that you speak of - they were used for their cisterns too (new to us - never heard about cisterns like this before). I hope to use your plans or to make one in our basement. Keep up the good work!!! My soil drains well, so water is not a problem. For root cellar purposes, you generally want high humidity. I have a pair of 4 inch vents in the side walls to keep it from being too high. For shelter purposes you would not want so much humidity. You should have more vents, and coat the outside of the blocks with tar. I have a dirt floor. A concrete floor with a moisture barrier would make it a lot drier inside. robert, do you have any detailed planes for the root cellar? sure would like to get a set. Sorry, there are no plans. I often work with just a general concept in mind, and some crude sketches if I need them. The blog post contained the diminsions and a layout of the blocks. I didn't read it otherwise I assume the block are the stabdard 8" H x 8" W x 16" L. How deep and how many rows of block is going to vary according to the frost line at one's location. No doubt free plans could be found on the web, or Your County conservation office may have plan available but, the following is a booklet I receive in collection of booklets I purchase long ago. Have you made any you tube videos on your projects? No, I haven't. It is difficult to take live video because when I begin a project, I often don't know how it will turn out! Plus, I often change things in the middle of a project if I am not satisfied. For example, I made the root cellar 8 inches wider than planned, and that is why there are the short blocks in the wall with the stairs. How would you go about shoring the edges of a plan like this? 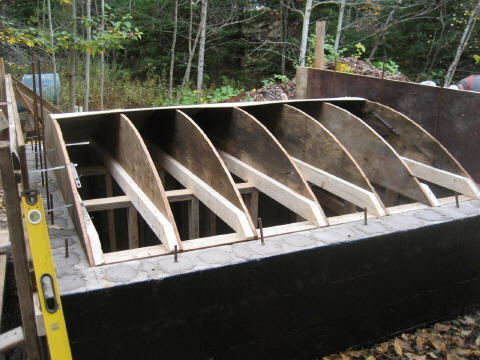 Do you know how you would go about shoring a project like this? Speaking as someone who has built something very similar indeed, you have done a very beautiful and well crafted cellar. The blockwork is nicely done and i loved the roof. I did mine with beam and block, but i liked your sloping roof. There is another way of doing blockwork for smaller projects which i learned after doing mine but have used it on smaller builds, if you stack the blocks dry (without mortar), and use a vibrating pole and steel reinforcement when filling the centers of the blocks, you can attain very fast but strong build. Will this still make for a waterproof structure, and will it be just as strong? If no mortar is just as good as with mortar, why does anyone still use mortar? awesome my sister really wants a root cellar so this might be an idea (for her). Did you and if so, how did you support the concrete roof? And does it get moldy in there? Robert, thanks for taking to time to document your work. I just had my hole dug and plan on getting the footing poured soon. A question if I might, why did you choose the inside width dimension at 7'4 - 5/8"? 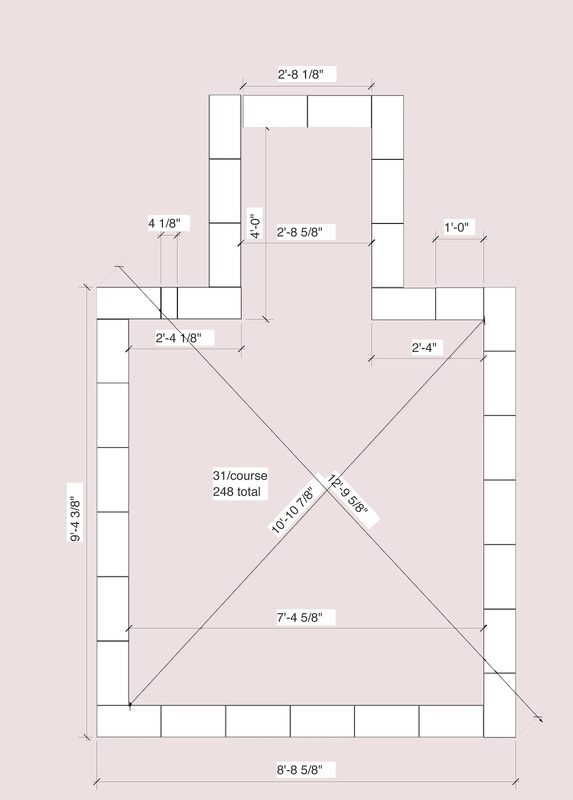 I will be using 8' plywood to form the arched roof and plan on making the inside width 8'. Am I missing something? Also, mine will be 24' long. The reason I made mine smaller than 8 feet inside is that my hole was too small. Go ahead and make yours 8 feet wide. Thank you for sharing I would love to have a root cellar for my canned foods. It all looks great! I like the lower roof - cannot see it once covered. Not so conspicuous. However 2x6 const instead of 2x4. The cross sections 2x6 w plywood sandwiched between 2 2x6's and glued. Makes for a very strong beam. Great plan and idea to go from. Thank You. The wood is only a form for pouring the concrete roof. It is removed after the poured concrete is cured. I was just talking to my Mother about building a root seller so I can start to can my own produce. Thank you so much for this, it gives me some great ideas. My question has to do with the pouring of the roof. When you poured your roof, you obviously also poured concrete into the holes in the concrete blocks. How do you figure the amount of concrete you'll need, to fill those holes? The concrete only goes down 16 inches into the blocks. Since it is a relatively small percentage of the total concrete used, I didn't make any calculations for that. Thanks do much for the detailed pictures and comments. We're ready to build one soon! Robert, I really like what you've done. I'm wanting to build me an underground house, that also has a floor, that is about 800-1000 square feet. I'd like to have a total of about 5' of soil/concrete on top of it. 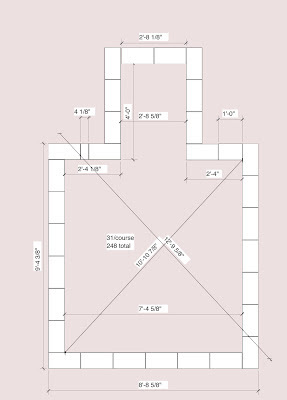 I'm thinking that 20'x40' or 20'x50' is how I will design it. I like your idea of an arched roof, and I like it that you were able to pour it yourself. Perhaps with the size I am wanting, that is not an option for me, since my plan is so much bigger. I like the last picture on this page, of the higher arch. How do you pour the concrete so it stays at an angle and doesn't just slough off of your slope? Do you have to build some sort of form on the top as well? Also, how did you keep your seams on the roof waterproof between your mixes? Did you do the entire roof the same day so none of it could set before you poured on the next batch? David, my lower arch did not need an upper form. I am not sure what the people who built the higher arch did. Since I was mixing and pouring myself, I did the rood in 3 parts. It worked out fine, without any cracks or leaks. I saw this a few months ago when I was figuring out how I wanted to replace the roof on an existing cellar of mine. I used the arch concept along with a few other ideas and it worked out great. I didn't trust the existing structure to support the weight (7,000 lbs in my case) so I poured a perimeter slab about 3ft wide that I could form up and set something like this on. The perimeter slab will also help keep moisture away from the walls. My cellar is 8'x10' and I went 16" high at the center and poured it 6" thick with a similar rebar. Seeing that it's been done is really helpful when brainstorming a project like this so thanks for sharing! Great project. This is the size and style I am looking to build on my homestead. Thanks for posting this. How did you get on with the Planning Permission and Building Regs? If you found this content useful, please donate! No amount is too small, and all are appreciated! How to make a pole-barn style garage look like a million bucks.